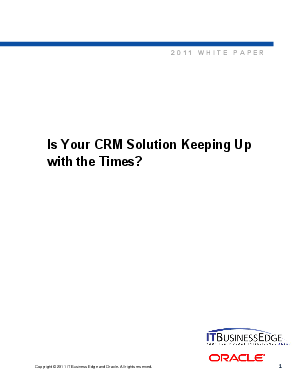 > Oracle > Is Your CRM Solution Keeping Up with the Times? The decision to upgrade to the latest version of an on-premises enterprise software package is never simple. In evaluating the decision, companies should consider not only the costs of upgrading but also the costs of not upgrading. When the business climate is rapidly changing, a CRM solution that can't keep up is a serious liability. In this whitepaper, IT Business Edge explains the key business and technology factors to consider in deciding whether and when to upgrade your CRM system, including the SaaS factor.